Invite your friends and family to jump with you or just help us spread the word about our charity skydives. The more people we get to jump the more money we raise for WHY We Hear You. We Hear You works across Bath and North East Somerset, Somerset and Wiltshire providing emotional support to patients, families, friends and carers who have been touched by cancer or any other life threatening conditions. 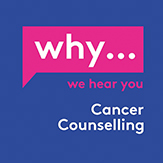 At We Hear you we understand that cancer and life threatening conditions can be overwhelming. It can leave you feeling numb, isolated and terrified and can seem too big to cope with. We provide a safe space where people can say the unsayable and ask the unanswerable. Although WHY is committed to providing a free service, our counsellors are fully qualified and paid for the work they do. WHY offers a minimum of 80 counselling sessions each week and support around 350 people every year. One counselling session with WHY costs us £44 and we rely entirely on voluntary donations from individuals, local businesses and grant-making trusts. Any contributions whether large or small are of great value to us.